Fans' favourite Guy Martin on the Honda Racing Superstock machine at the Cookstown 100 in 2017. 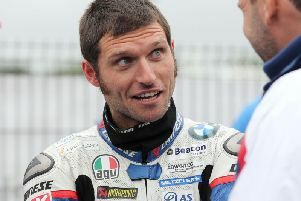 Following on from the news that Guy Martin is set to race at the Tandragee 100 in May, the much-loved TV presenter is also on course to compete at the Cookstown 100 in April. The Lincolnshire rider has built his own BSA Rocket 3 and has signalled his intentions of returning to the Cookstown 100 to contest the Classic races. Guy Martin's much-hyped comeback in 2017 with Honda Racing did not go as planned. Martin won both Superbike races on the Tyco BMW in 2015 but struggled on his most recent appearance last year, when he rode the Honda Racing Fireblade and a 600cc Honda for Wilson Craig. The English star endured a tumultuous season in 2017, with Honda Racing withdrawing from the North West 200 after John McGuinness crashed in practice, while Martin himself was fortunate to escape injury in a big spill in the Superbike race at the Isle of Man TT. Honda later pulled out of the Senior race and Martin’s short-lived association with the team ended soon afterwards. Speculation suggested the 36-year-old truck mechanic had quit racing for good, but he later vowed that he still intended to feed his passion for motorcycles through other projects. The KDM Hire Cookstown 100 will take place from April 27-28.